Feel like royalty on a guided 2-hour tour of the majestic Pitti Palace in Florence, once home to the city’s powerful Medici rulers. Skip the entrance lines for this essential Florentine attraction, and learn the history behind the grand 15th-century estate as you walk through opulent apartments and galleries adorned with masterpieces of Renaissance art. Meet your guide near the entrance to the Pitti Palace (Palazzo Pitti), located on the southern banks of the River Arno. Bypass the entry queues with skip-the-line access, and head straight inside to begin your tour of the magnificent Renaissance estate. Listen as your guide shares information on the history of the palace, originally built by Florentine banker Luca Pitti in the mid-15th century and later occupied by the Medici family that ruled over Tuscany during the Renaissance. Step inside the luxurious royal apartments where the Medici and other illustrious residents lived and slept, many of which have been preserved much as they were during the family’s peak of power. 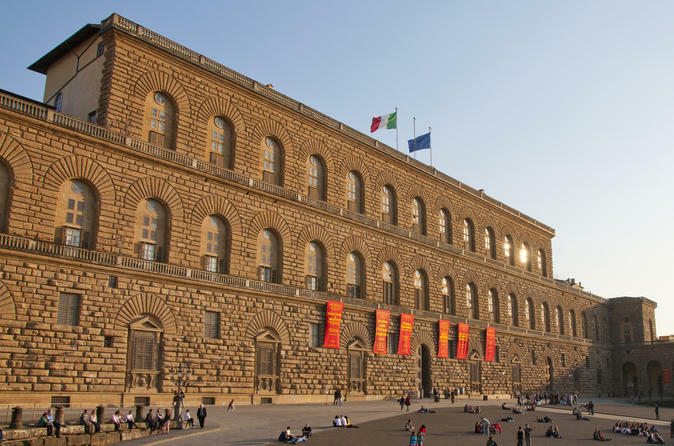 Today, the Pitti Palace is also one of the largest museums in Florence and houses an immense collection of artwork from the Renaissance through the 18th century, including masterworks by Raphael, Titian, Caravaggio, Rubens, and others. Visit the Palatine Gallery and learn the background behind its most important works from your guide, including not only paintings and frescoes but sculptures, porcelain, and other invaluable examples of European decorative art.